In medium bowl, beat eggs, half-and-half, Dijon mustard, salt, thyme and pepper with whisk. 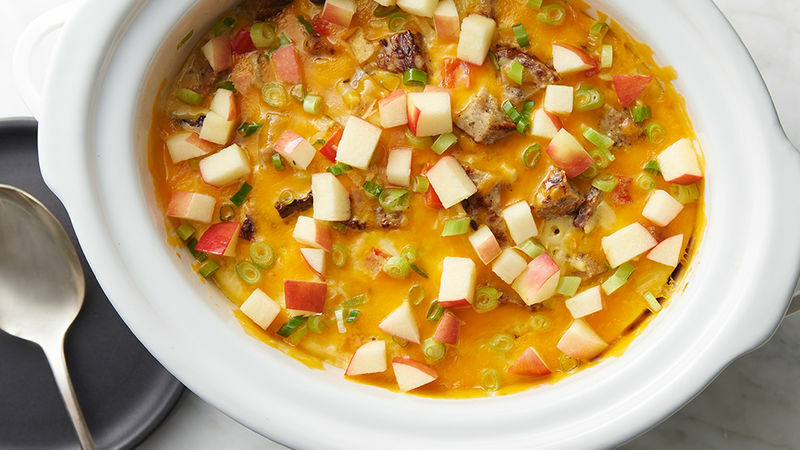 In slow cooker, mix hash browns, sausage, bell pepper, green onion whites, 1 1/2 cups of the cheese and egg mixture; stir to combine. Cover; cook on Low heat setting 2 hours; carefully remove slow cooker's ceramic insert, and rotate insert 180 degrees. Cook 1 1/2 to 2 hours longer or until temperature reaches 160°F in center and egg mixture is set. Sprinkle remaining 1/2 cup cheese and green onion greens over top; let stand uncovered 10 minutes. Serve topped with chopped apple. Cooked chicken apple sausage links can be substituted in this recipe for the patties. Just slice or chop into bite-size pieces. A fully cooked (160°F in center) casserole may still have some moisture present on the surface, which will absorb as it rests.